The scene was outside my girlfriend’s family house in the Pound Hill area of Crawley in Sussex. This was a part of Crawley – the new town. These houses were built, as we can clearly see, prior to the mass use of the motor car. But at least there were drives for off road parking, although the houses you can see shared a drive between each pair. That was fine as long as each house had just one car and kept it in the garage. These days it is probably much more of a problem for there are cars everywhere. In this photo there is not a car in sight. 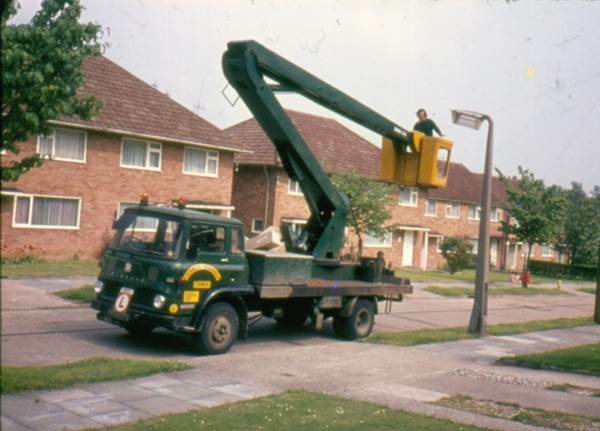 The only vehicle is the modern Bedford lorry with its chap about to change a street lamp bulb. I remember what had been used before. I have a vague memory of lorries with a vertically rising platform like a kind of multilayer scissor jack. They were wound up and down by hand and the lorry had to be placed precisely because the tower had no sideways movement. But even more I remember the electricity workers who climbed up the wooden poles with boots with ‘nails’ in the side which they banged into the pole. They also had a big strap around them and the pole. Up near the top of the pole there were a pair of footrests and the worker could lean back on his strap whilst carrying out his task. And then along came the cherry picker which did away with these old ways. I commented recently on my liking of cast iron signs. Well of course, it doesn’t matter if they are cast iron or not really. 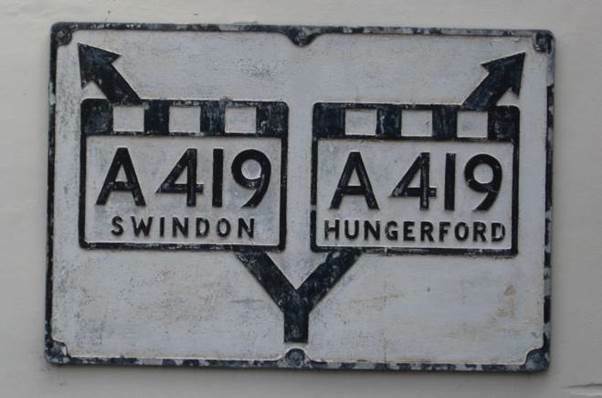 I can just like old signs – and here’s a road one. From memory, this was on the Isle of Anglesey. I took the photo in the early 1970s. This is in black and white so I’d have used an Agfa rangefinder camera and, almost certainly Ilford FP4 film. I processed black and white myself. These days signs like this are ‘international’ in style. That means words are not used. Simple cartoon like images represent the hazard, instruction or advice. But this one has the best of both worlds. The picture of a double decker bus having to be in the middle of the road under the bridge is clear. And so, too, are the words. No doubt much money has been spent replacing old signs with new, to meet some ruling laid down by our lords and masters in government (now surely that should read ‘our servants in government’.). But some have slipped through, and occasionally you can come across what looks like an old sign still in situ, by the side of the road and still doing the job for which it was intended. This one is in Ramsbury in Wiltshire and uses the dashed black and white area to mean the routes lead to the A419. It was photographed in 2012. Being a nerd doesn’t mean you can’t be just a bit romantic. So back in 1996, when we celebrated our silver wedding anniversary, it seemed right that I should fulfil a long made promise to take my wife to Paris. Of course, I was mindful of the fact that there was now a channel tunnel and a train service which ran (then) from Waterloo to Paris. That was how we would travel. And what an easy journey it was. Our son, at home from uni for the summer was able to drive us to Salisbury. We caught the train from there to Waterloo and then caught the 10.23 train – next stop Paris. Yes, I have the ticket. It was easy for us, but not for a Spanish family who were nearby us who thought they were on the train for Brussels. Just as the train left Waterloo a row broke out over seats. There appeared to be two sets of people with reservations for the same seats. An attendant then realised the Spanish family were on the wrong train. Oddly, my wife had speculated about this risk before the doors closed at waterloo. Announcements were made on board telling us that this was the Paris train and those who wanted Brussels should board the train at the other platform. The word that came through loud and clear to the Spanish family was ‘Brussels’. They repeatedly heard the word and understood it. They were sure they were on the Brussels train as a result. It was just as my wife had speculated. Of course, I don’t know how their journey panned out, but they arrived in Paris at 14.17. They had no seats for the journey. They perched on their luggage. How or when they got to Brussels was, I hope, sorted out by them. We had a wonderful time sightseeing and, in particular, visiting art galleries. Musée D’Orsay was, for me, simply the best. And it wasn’t just because the gallery is in an old railway station although that may have helped. Maybe sometime, I’ll find some Paris photos for this blog. But here I shall comment on the ride. It is very, very smooth and of course, you get to travel at 300 kilometres per hour. In the tunnel, there is virtually no sensation of movement. What sticks in the mind is travelling, at some speed, through the French city of Lille. It has many tower blocks and whilst, unfelt by passengers, the train leant into the curves, it appeared that the tower blocks tilted, first one way and then the other. It was an experience I enjoyed very much. I must be mad! On our return journey we had a stopping train (well, it stopped at Lille). The tilting towers were nothing like so noticeable at lower speed. The Kennet and Avon Canal rises up its 29 locks into Devizes – locks which in the bad old days were utterly derelict but from Devizes, heading east, there was a 15 mile stretch with no locks – The Long Pound. This stretch held water but with virtually no flow on it, it was always very weedy. However, it was an ideal stretch for trip boats which could raise money to help save the canal. One such boat was known as the Charlotte Dundas. In the early 1970s, my wife and I were volunteer crew on the little boat which could carry up to 28 passengers. The name, presumably, was chosen as the same as an early steam boat – the first one that really worked, but Dundas was also the name of the first chairman of the Kennet and Avon Canal Company. Our Charlotte Dundas was a paddle boat – she could cope with weeds in a way screw driven vessels could not. The power came from a diesel engine and transmission was hydraulic. She was entirely double ended. Turning Charlotte Dundas just involved removing the tiller from one end and walking it around to the other. Here she is in 1980. We are not the crew. My wife and young son are on the towpath looking on. In fact the boat had been modified a little since our day. The far end had weather protection by 1980. Back in the 70s it had been entirely open to all weathers. The boat has just slipped away from Devizes Wharf. I guess the steersman, standing on the back is just tidying his mooring rope. Paddle wheel drive and slow speeds made for hard steering. We always had a person ready to assist by reversing one of the paddle wheels if need be. Maybe controls had been altered by this time for when we crewed old Charlotte, one person was always by the central engine house to manage the paddle wheels. Charlotte had a flat bottom which made her rock and roll very easily. Times change. 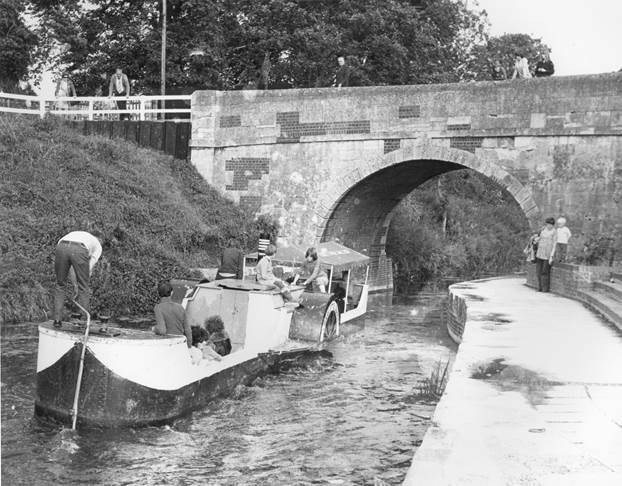 Once the canal was open, better boats could do the trip work. I’m not sure where the Charlotte Dundas is now. What is it about cast iron signs? I love them. They often give information and tell some history at the same time. Just look at this one, photographed by me back in 1976. 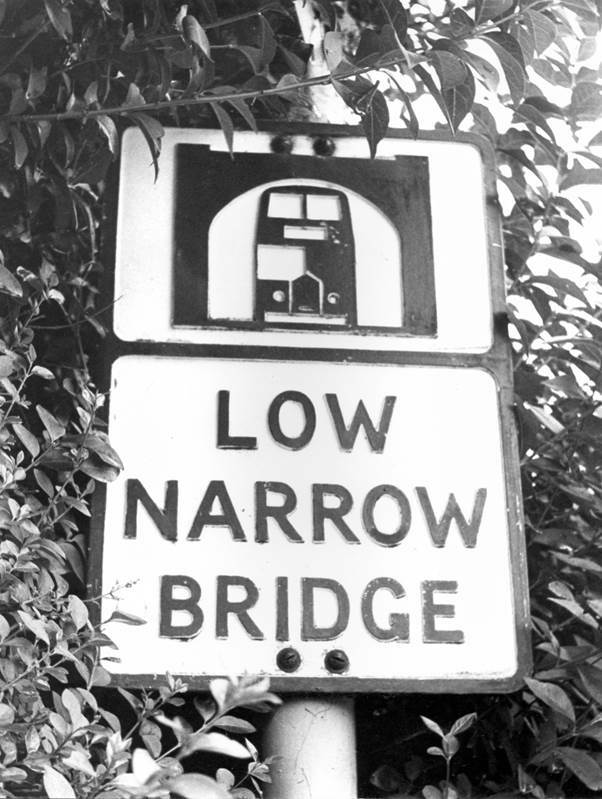 Well first and formost it told me I was five miles from Braunston. That’s a canal junction where the Oxford Canal meets the Grand Union Canal. Braunston is in Northamptonshire. But this wonderfully long lived mile post was set up by the G.J.C.Co. That’s the Grand Junction Canal Company. The Grand Junction was the original name of the canal from London to Braunston – now part of the Grand Union. 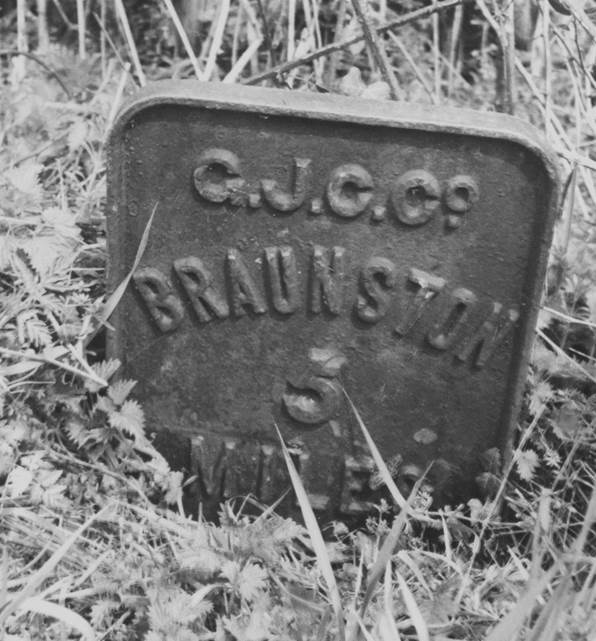 The first bits of canal, around Braunston, opened in 1796 so there’s a fair chance the old sign dates from the 18th century. If you search on the web you’ll find lots of these signs – now all neatly painted and properly supported above ground level. They look good, but I like the lost world look of this one from days of yore. Back in the 1970s, and before a lovely TV comedy series took the name, we lived the good life. We were, I suppose, in that stage of being what now gets called ‘DINKY’ – dual income – no kids yet. We scrimped and saved and bought our very run down house with its dubious right of access – and a very large plot of land. All worked out well, in the end, so we were very lucky. We could indulge in a bit of self-sufficiency. There were times (for we rapidly turned into three of us with one income) when our finances were horribly tight and we were eating weeds as vegetables. For milk we kept a goat. So that’s me milking Shamrock the goat. I have temporarily tethered her with a spike through a large metal collar which could take a bell. Her kid clearly wants to play. When you know the source of your milk you soon get to learn more about the link between the animal’s food and the milk you get. 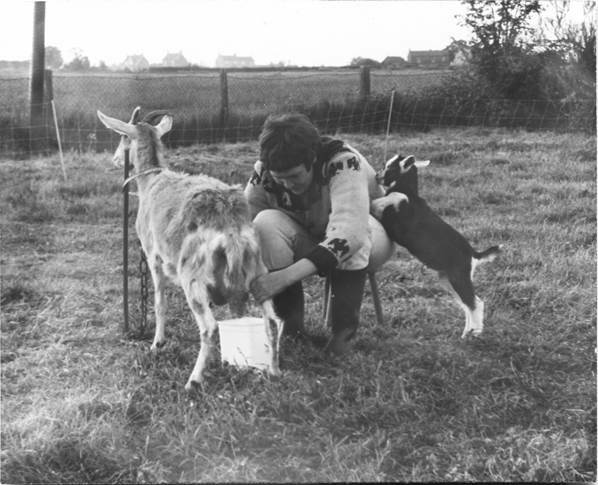 If your goat has rubbish to eat then you get milk with a rubbish taste – it gives off a goaty aroma. Feed her well and your goat will give you a good supply of very pleasing milk. Nothing was waste in those days. That’s our front lawn, allowed to grow so that Shamrock the goat could enjoy the lush grass. There’s an electric net around her – which was more to control the kid. If we had a kid, we must have used the services of a Billy Goat. Now they have a truly pungent smell. We once walked one from one side of the village to another, using ropes to keep it under control. Thirty years on I can still smell ‘Billy’ on that rope. Eventually, the demands of work and life made twice a day milking a problem and we returned to the milkman for our supplies. But it was fun whilst it lasted and it is one of those things I am glad to have done. Back in 1970, when we travelled around Scotland by rail, I was disappointed not to be able to get to Thurso, the most northerly station in Britain. There was a choice of termini in Caithness and we found that only Wick served our needs so Wick it had to be. For the next 34 years it grieved me that I hadn’t travelled the 10 km (if it was straight) to Thurso. 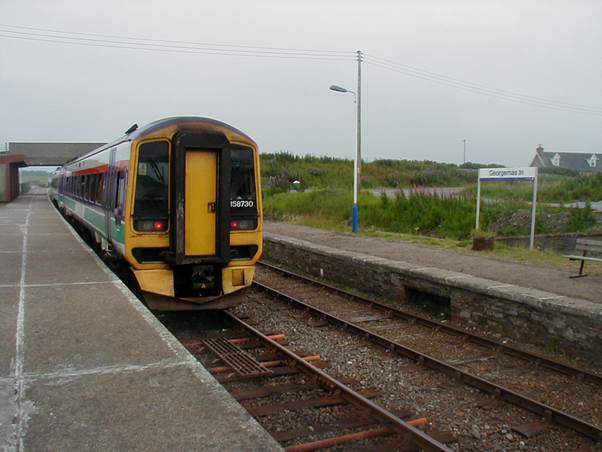 But in 2004, prior to travelling to Orkney, we were near Thurso and we took the opportunity to head down to Britain’s most northerly junction – Georgemas Junction. And here is that junction. The ‘main’ line here with double track, is heading off towards Inverness. 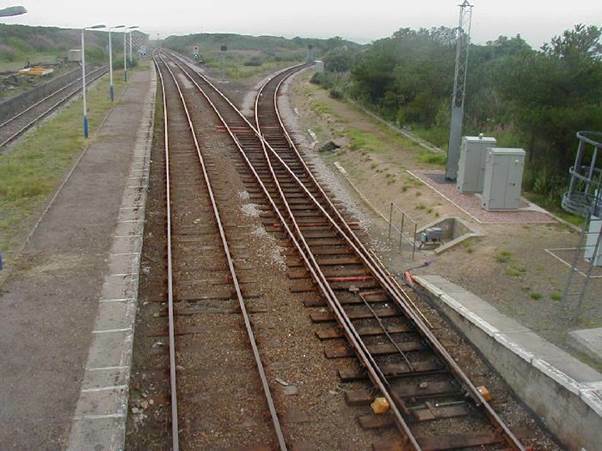 The Thurso branch curves away to the right. At that time Georgemas Junction still had goods facilities in use. That’s the siding on the left. Behind us, the line heads on to Wick. Georgemas Junction is still a passenger station and here’s the waiting train. It is heading for Wick and it will return before going south to Inverness. 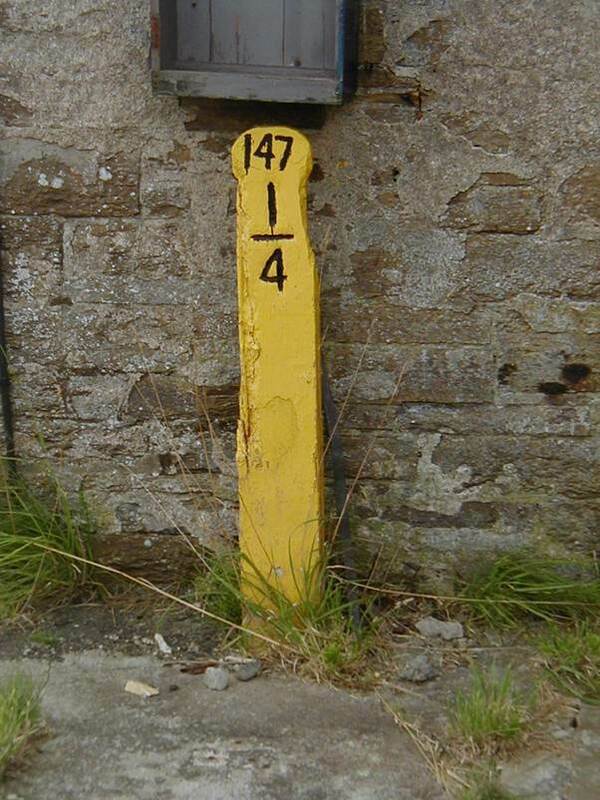 That sign tells us it 1s 147¼ miles to Inverness. We took a Thurso train. 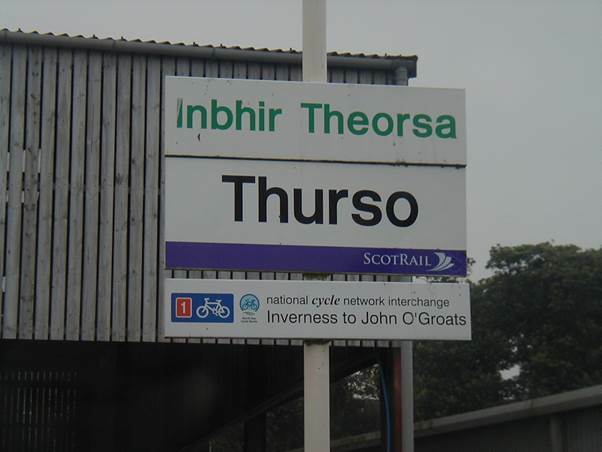 Thurso station has bi-lingual signs – English and Gaelic. So there we were – the most northerly rail line in Britain had been travelled. Yippee! 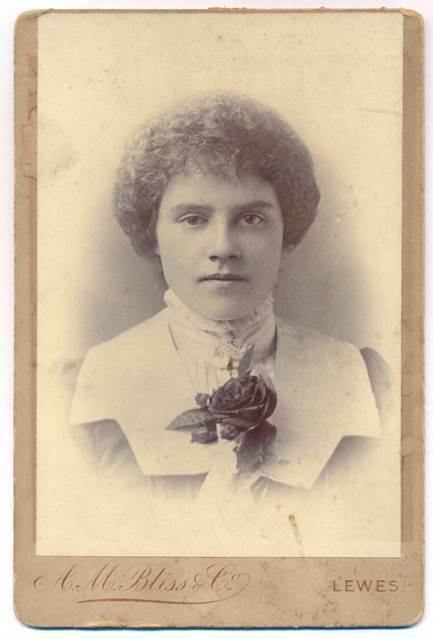 Emily Susan Stevens was born on 24th April 1882 at Ringmer in Sussex. Ten years later, her baby sister, my Granny, was born. I never knew Sue – she died in 1944 so I shall let my dad tell of what he knew. In saying that I have little memory of Aunt Sue before about 1930 I am reporting my memory, not facts. I am sure she came to visit us in Bexhill and there is a photograph of her with me, aged about 3, on the lawn at 62 Wick Street drawing still lemonade from one of those big stone jars. She was unmarried and lived in Brighton. I suspect that a boy friend had been killed in the 1st world war and that his name may have been Macnamara because that name often cropped up in conversations between my elders. She was lively and attractive but decidedly on the plump side. I do not know how she lived but the impressions remain that she had some domestic function which was not quite that of a maid and that the Macnamara family came into it. After she came to live in Ringmer to look after aged parents she earned a living by working with and for the headmaster of the local school (Mr.Self) on an unusual project for the time. Many of his pupils in that sparsely populated area walked considerable distances to school relying on what they brought for midday meals which were usually unsatisfactory in quality even if not in quantity. Self and Aunt Sue set up a ‘kitchen’ in an outbuilding and equipped it with one copper, two 3-burner Valor oil stoves and a sink. They worked out a menu and bought food. 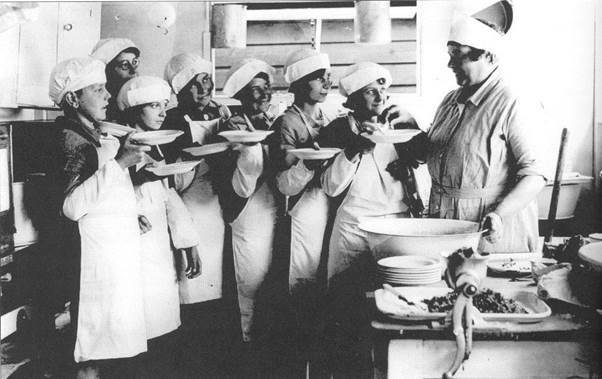 Older girls acted in turn as kitchen and scullery maids; it was regarded as instruction in domestic science. At the end of morning school other children acted as servers. Meals were eaten at desks; there was nowhere else. Sue’s modest wage was the only labour cost and meals were so cheap that even poor families took them. I cannot remember the figure but I remember that my necessarily cost-conscious parents thought they were a good buy. I do not know that this pioneer venture, 20 years before an official school meals service, has ever been written up. In 1932 Sue, aged 50, married widower Percy Ford and moved to 1 Elm Tree Cottages, adjoining Ringmer School – a service cottage that went with Percy’s job as the local roadman and clearly convenient for Aunt Sue. It is still there with little change except that the elm has gone. No. 2 was occupied by the policeman and still is. We went to the wedding in a hired car and from this I learnt the route and was then prepared to cycle over from time to time. There is a photograph of me and a school friend (Jimmy Gordon) with our bikes in front of the elm tree. Apart from the journey I have only one memory of the wedding – there was a pretty girl of about my age from the Ford side. I remember nothing about her except that she was Jennifer – a name I had never met except in poems or historical works and it fascinated me. A bit of that fascination remained 35 years on when I met the young lady I subsequently married, (not that being called Jennifer was the only attraction). We spent one Christmas there – 1935 or 36. I had never spent a Christmas in wholly rural surroundings; Bexhill was more like a suburb. I enjoyed the experience which was also my first experience of a full moon as a practical asset rather than a decorative feature when there are street lights. My specific memories are both about food. I was disappointed to learn that we were to have beef for Christmas dinner. We had beef at home on ordinary Sundays and I looked for poultry or at least pork for Christmas. I changed my mind when it was served. Whereas beef in Bexhill meant small rolled joints, this was an aitch bone almost too heavy to lift which Percy had chosen on the hoof. It was already cooking before breakfast and it was a gastronomic treat. It was served garnished with, among other things, a ‘game bird’. I wanted to know if this was a pheasant or a partridge but nobody could say. It was pointed out that it could hardly be either of these preserved species. I never heard what species it was and as I am now the sole survivor from that Christmas dinner I suppose I shall never know! On Boxing Day we made our way to Firle for tea with the Toms family before returning to Bexhill. (Christmas festivities could not be prolonged in my childhood because days off meant no pay; there was always this negative side to Christmas and Bank Holidays.) That Christmas also marked my peak as a practical joker. 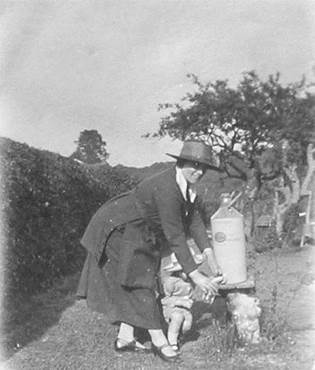 I caught my cousin Julia (Hughes, see below) with a dribble glass and my cousin May Toms, wife of Frank, with an ink blot which I placed on a white linen table cloth as tea was being laid at Firle. Beside it I arranged an overturned ink bottle,, the stopper was still in place but nobody noticed. When May saw it she screamed and dashed to the scullery for a wet cloth. When she discovered the nature of the blot she attacked me with the wet cloth which was uncomfortable but worth it. My sister stayed once or twice with Aunt Sue who had a soft spot for her. I never did, though I made several visits by bike. The last time I saw her was in 1942 (I think) when with the girl friend I later married I took a days outing by bus from Tonbridge to Heathfield and Ringmer. I am glad Dimp met Aunt Sue – a bit of continuity between old contacts and new ones. Aunt Sue died in July 1944 having been ill for some time with cancer complicated when she fractured a femur by falling in the garden. I could not get to the funeral: my mother and sister went and my sister inherited a few of her things including her sewing machine. Percy survived her. I never saw him again but I heard of his death in the 50s from Aunt Nellie. 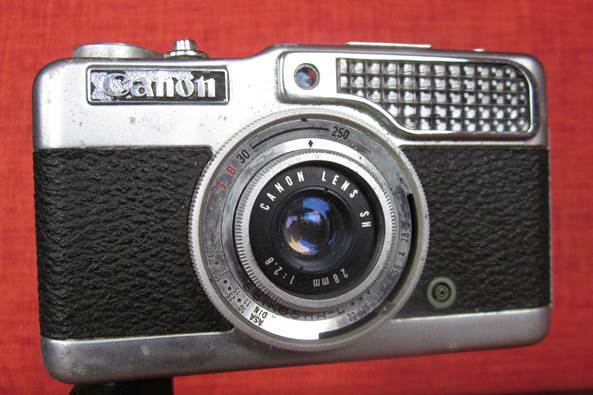 From time to time I mention a camera I used to use – a Canon Demi. 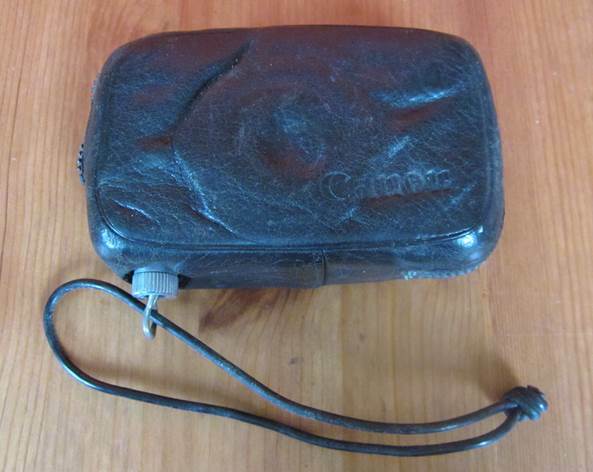 This was known as a half frame camera which meant you got 72 half sized colour slides off a 36 exposure film. For its day, it was cheap to run. Now I have love affairs with cameras and find it hard to discard an old favourite and then suffer pangs of guilt when I do, finally, move on to a new one. By that time, there is usually some kind of a problem with the camera and it is way past a sell by date. But I can’t discard it. It goes in a cupboard to be lovingly looked at every now and again. So here is my Canon Demi and, having not looked at it for a while, I am surprised at its size and weight. By present day standards it is big and heavy. It comes in a soft leather pouch. With its wrist strap, it looks almost modern. Let’s stick it on a little tripod for some more views. It really has very tidy lines and is about 11.5 cm from side to side. The large prism area is the light gathering exposure meter and next to it, the small round window is the viewfinder (and how I still love a proper viewfinder). Down next to the lens is a small connection. This is for flash. There was no integrated flash gun back then. 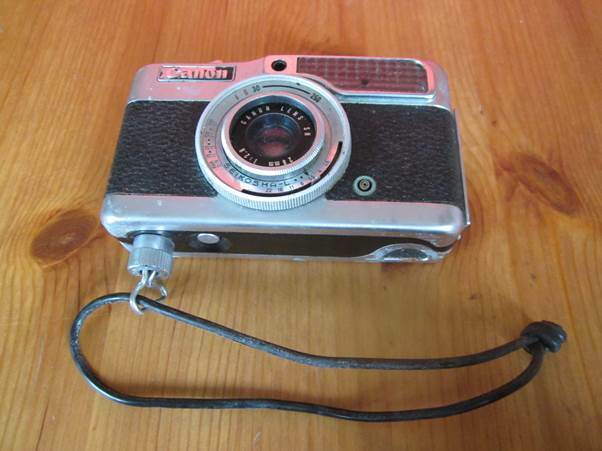 I bought the camera second hand in the late 60s. There are the controls. The exposure was semi-automatic and allowed times of between one thirtieth of a second and one two hundred and fiftieth. The aperture opened to F2.8 but could be closed down to F22. The weakness was focus which had to be done manually in advance. 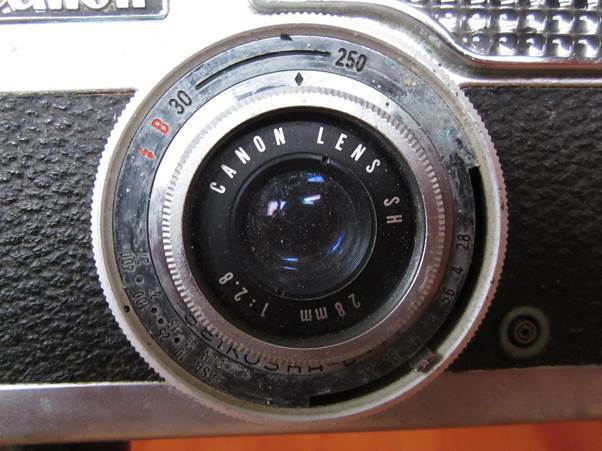 The inner ring around the lens had various symbols and a plate on the back of the camera explained them. On top of the camera we had, on the left, the rewind lever. 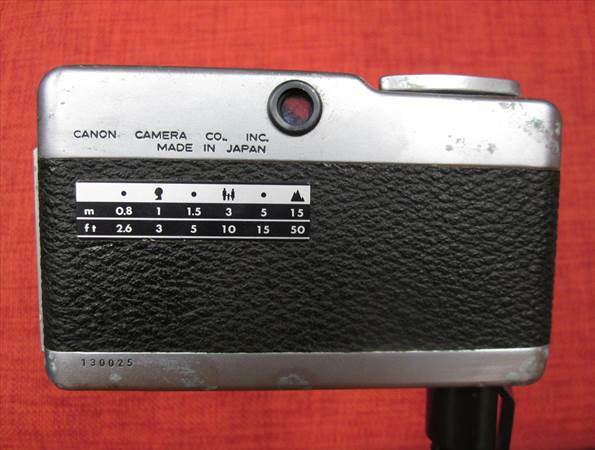 When you had taken your 72 photos, the film had to be wound back into its cassette and that was used, in conjunction with a button on the bottom of the camera. Above the word Demi is the exposure meter. You twiddled the outer dial on the front until the two orange pointers lined up. Over on the right hand side we have the shutter button, complete with a screw thread inner so that remote leads or time delay devices could be fitted. The lever is to wind the film on by one exposure distance and just above it was the counter which told you how many pictures you had taken. As I write this it sounds so incredibly old fashioned! But then cameras and photographic habits have changed out of all recognition in the last 15 years. No longer do most of us have to open cameras and insert film. So there’s my old friend opened up. You dropped your cassette in the left hand end and carefully made sure that the film sprocket holes were properly on the sprocket wheel just right of the lens. You poked the tongue of the film in the take up spool at the right hand end. You shut the camera and wound the film on twice and were ready to go. Readers of my age will remember all this and may feel a sense of nostalgia. Readers under thirty may never have used a film camera. They’ll be gobsmacked at how manual it all was. I was using this camera into the 1980s, really until slides went out of fashion. The cost advantage was much reduced for prints and we moved to a more modern camera. I am almost, but not quite, tempted to get hold of a film and see how the old Demi does. For the record, my present point and shoot camera is about half the overall size of the old one. It deals entirely automatically with exposure and focus. 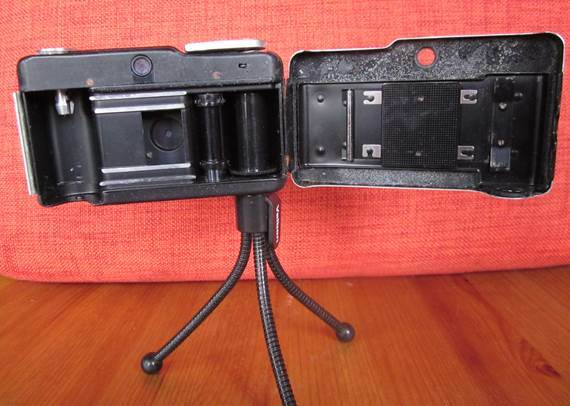 It has a built in flash and a proper viewfinder. It takes pictures which I can happily print up to A3 size and of course needs no film although it does use batteries. A bit of my cooking! People who remember the 1970s in the UK may recall a time when ‘we did it ourselves’. These days there’s an expectation that other people do it and sell it to us although (and I say praise be), that may well be changing back again. So what was it we did ourselves in the 1970s? We made our own food and drink. One thing that many of us did was make wine. Of course, we tried to use the fruits of the field which we could obtain for free. Vegetables could be used as well – but I’d advise one and all to avoid pea pod wine – about the ghastliest drink ever. As an adjunct to wine making, we also made some fizzy cordials – elderflower champagne being one of them. This, I suppose, was just slightly alcoholic, for it obtained its fizz by the action of yeast on sugar, but it was drunk very young so alcohol levels must have been very low. It was delicious and had all the usual advantages of home-made – you knew just what was in it. 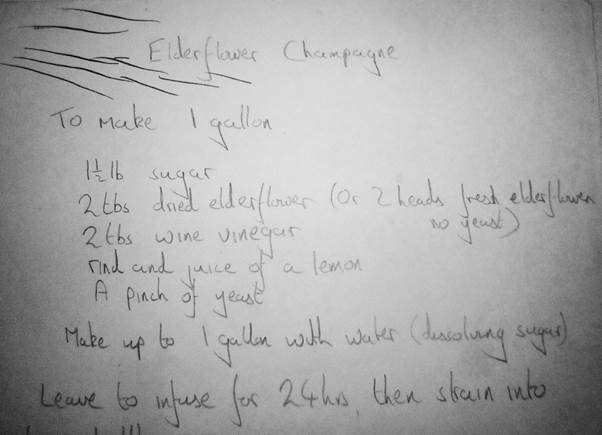 Just recently we visited some old friends and Pete produced his recipe for elderflower pop. It is in my handwriting. Bad photography! I missed those last two words which said strong bottles! Of course, we shared tales of disasters. On one occasion Pete didn’t use strong enough bottles. There was a major explosion and glass from the bottle was found embedded in walls everywhere. Apparently people had been in the room at the time, but escaped all injury. Our error was one of sheer stupidity. I didn’t leave a decent air gap in my perfectly strong bottles and then I put them on a sunny window sill. The liquid expanded and the bottles cracked open – no explosion as such. But the elderflower champagne, under pressure, ended up thinly smeared over every part of the room. We were out of the house at the time so just returned to an appalling mess to clear up. Hang on! Perhaps this is why people moved to letting the experts do it for us! I’d still recommend the drink – but it is sugary as the recipe makes clear. These days we make a still cordial flavoured with elderflower. This is even more sugary, but gets diluted enormously before drinking.